I have been wanting to do this for long! Bring to light the various careers available in the food industry. In India a career in food generally means a chef, but this is not true. Gone are the days when magazines would publish recipes with a poor picture, when food writing meant simply recipes. These days food photographers, stylists and writers have created a niche for themselves and are no longer treated as simply freelancers! Find out more in this new series on Tongue Ticklers where I present to you interviews with people in the field and get them to share their knowledge with you! Tongue Ticklers presents Rushina Munshaw Ghildiyal– Food Blogger, gastronomy writer, recipe developer and food consultant. TT: What made you foray into the profession of food writing? RMG: Food writing happened entirely by chance for me. I do not have any qualifications in journalism. I was a literature and fine arts student at school, went on to study animation and then worked in the travel industry for 2 years. I discovered food writing while on a sabbatical after I had my first child. As the mother of a toddler I was pretty much confined to my home and the internet was my lifeline to the world. I spent hours surfing the net, reading about all sorts of things and experimenting with blogging. It was at this time when I was looking for information (on pickles I think) that I discovered egullet.org, home to like minded people who reveled in food. I spent weeks dithering around, lurking through its forums, scribbling a line or two here and there until I finally worked up the courage to put up an essay on Uttarakhandi Cuisine. The cuisine in question being unknown, my post got a lot of attention and my inherent talent for research and writing must have come through because I got a lot of praise. The post was the first step to a book that is awaiting publishing but more immediately it brought me a job offer with a local gastronomy magazine and made me realize that perhaps there was a career for me in food writing. I don’t think contact or rolodex is necessary but passion and dedication are, to enter the field. In the end these qualities make people take notice of a writer and their work. TT: How do you go about getting assignments and approaching editors? Do you come up with ideas, and then pitch them to editors, or do they assign stories to you? Do you send in the entire article or just a short summary/pitch? RMG: Different publications require different approaches. I prefer to first email a publication, introduce myself and my body of work and then offer to write for them.They usually bite, and I ask if they want to assign stories to start with. Once I get a feel of what they want and the stories they like, I begin to make suggestions. Most publications like to be planned so its win-win all around. TT: If you come up with your own ideas, then how do you keep coming up with fresh, original ideas? What does one include in a food writer’s column apart from giving recipes and reviews of restaurants/shops etc.? RMG: I prefer to circumvent restaurant reviews and other generic articles. These are easy to write but my approach to them is of a “have to get this article out” sort of attitude as opposed to my usual feeling of eagerness that subjects I gravitate towards inspire. I have found that articles that motivate me are ones that deal with subjects closest to my heart; the food on the plates of real Indians, culinary history, the migration and evolution of cuisine, sustainable agriculture, the intersection of food and culture, food as a carrier in the evolution of a culture (preferably researched at the knees of someone’s mom or grand mom) and my India is a rich country for that. I also take inspiration from actual circumstances in my life and food issues around me, for instance when I was pregnant, I did a series of stories on nutrition for pregnancy, now as a mom I like doing stories on food for kids. And more currently I am working on a recipe feature on fortifying dals with green veggies since dal prices are up but veggies have come down recently. Food writing is a field that requires constant educating and re-educating. I study nearly every day to keep up with trends and food facts. I inhale every bit of food writing I can get my hands on, have about 500 books on food, encyclopedias and histories of foods and food names. The best thing is being forced to try new things. While working on the ‘Dals with greens’ article, I had a great time discovering the amazing variety of green leafy vegetables we use in Indian cuisine (I found 7 in Mumbai alone). I made three new dishes with them; an Irani mixed greens offering called Gormeh subzi, a forgotten Gujarati recipe called Dakho and a concoction all my own combining greens and dals. It was heavenly, but I would never know without trying it all. TT: This one is for those who want to know the basics – How does one start off as a food writer? What are the essential qualities and qualifications one needs to get into this profession? Food writing has a long way to go toward achieving the cult status it enjoys in the West. There are very few food writers in the true sense and no formal training courses. Globally it is categorized under the larger umbrella of writing in general and has its niche covering everything from articles for print and web to books related to food, and encompassing subjects ranging from food (and drink) production to consumption. Conversely, food writing is an undefined, unrecognized sector in the publishing industry in India. There are less than a handful of food writers about, no formal training courses and even today few publications recognize food writers as specialist writers. In fact food writing in the true sense of the word is unexplored and Indian books on food are at a very rudimentary stage of evolution. Until about 2 years ago, I was still slotted under freelance writers at most publications. So where there is a set system in the west for food writing in India there isn’t one in India. One would think that with gastronomy becoming so popular, the print media would be overflowing with interesting articles on food. Not so. There hasn’t been a noteworthy growth in food writing. Although there are just more publications as compared to a decade ago, there hasn’t been a very dramatic shift in the way each handles food, the subject still has limited attention. To summarise, the first realization a food writer must have is that food writing is not just recipe features or restaurant reviews. It goes beyond that. Food writing like all other writing aims to stimulate the senses of the reader either evoking experiences, past or present or more practically motivating the reader out of the armchair and into the kitchen or the nearest restaurant. TT: You said that you have studied art in school. How does it influence your food? RMG: While I have been told that I have highly sensitive taste buds, eating with my eyes is equally important for me. A dish that stimulates visually enhances our eating experience. In this sense, my background in art has not only prepared me to appraise the ‘look’ of another’s dish but has more importantly allowed me to style my own preparations. This skill has been particularly valuable as I now style most of my own recipes and even those of my clients during photo shoots. TT: What are the advantages of being a food writer? RMG: It’s only an advantage if food is your passion. That being my state, the main advantage is that I get to do something worth waking up to every morning. Another advantage is lots of (too many sometimes) invites to food and beverage launches and events and hence the chance to taste the finest and latest, first. From this incessant tasting has stemmed fuel for my latent talents of networking, leading to many opportunities for me to introduce friends, clients and others in the food and beverage business to each other. One such connection I am proud of was being able to power the launch of Amore’s ‘Organic Gelato’ last year, India’s first organic ice cream. More recently it has been to bring together Mumbai’s food bloggers at a dinner for the first time, something that has set of many new friendships and conversations. I am working to make that into a regular monthly or bi-monthly meet-up. TT: What is a typical week day schedule for you? RMG: I get up by 7.00a.m to get breakfast and tiffins in place for family. If I am in an intense work phase and need to work late into the night. On those days my husband manages getting my son ready for school, getting his breakfast, making his tiffin and lets me sleep in. I try to get up in time to make my husbands breakfast about 90% of the time though. By 9:30a.m., the boys are out, then its me and my daughter. She’s had breakfast by then so it is bathtime, I love giving her bubble baths, she lies back like a little princess in her tub! By then my housekeeper gets in and takes over and I sit down to work. I work till about 2:00p.m when I break for lunch. I take a break for an hour because my son comes home at this time. We go through homework, negotiate TV time and then I get back to work until about 6/7:00p.m. I try to take a walk and cook at least one thing for dinner daily. The kids are fed at 8 and in bed by 9/9:30p.m. I rarely go out on weekdays and we try to have dinner as a family as much as possible, after which we have family time for an hour or so, drawing, reading or just hanging out. TT: Tell us the truth – how healthy do you eat? What is your favourite Gujarati dish? RMG: With all the kinds of food around, believe me, I wish I could eat unhealthy! But, food for me is much more than just than a means to satisfy your taste buds. It’s a way of communicating your love to family and friends by serving them food that is well meaning and therefore healthy. Eating responsibly and healthy is also a means by which I ensure that I stay healthy for my family. This has led me to explore healthy eating. I’ve discovered that it’s possible to have gloriously delicious food that is healthy at the same time. Junk food from outside is limited to once a month or less, instead I do healthy versions of pizzas, burgers and wraps at home. Frying only takes place on festive occasions (once in 6 months). Between meals my kids are encouraged to eat fruit or vegetable sticks first and then snacks. I also make my own jams and nutella, and my husband makes pasta and baked stuff like breads, cakes and muffins. My favourite Gujarati dish is ‘Turiya Patra no shaak’. TT: What made you start your blog – “A perfect bite”? RMG: In 2002 I took a sabbatical to have a baby. While on this sabbatical from work, in a strange new city, with a small baby, I would surf the net, looking for something to engage me in the hours until my husband came home from work. At that time, chatting was a new phenomenon (and unaccompanied by the baggage of suspicion it has today). In my online explorations, I came across Roshan. He was intelligent, made interesting conversation and indulged me by spending hours talking. We chatted almost every day, this stranger and I, and it got to the point, that I would harrow him by typing in CAPITALS until he dropped whatever he was doing to chat with me! So, in what I suspect was a move to give me something to occupy my mind, Ross introduced me to blogging. The rest as they say – is history. Initially it was just to write, an outlet for my creativity but after I discovered food writing it offered a means to showcase my work online at no cost (freelance writers have strict budgets!). Then somewhere along the line I realised what I really wanted to do was create a space that inspired people about a food culture we were losing to fast food and ready-to-eat packets. India perfected the nutritious culinary experience centuries ago and I wanted to preserve that. When I began blogging almost 9 years ago, I had no idea where it would take me. But even today on my CV, it says I am a blogger before all of the other things I do; writer, stylist, author, consultant. Today the blog is a space that offers a lot more than just my writing. It has become a place for conversations on food and a wide spectrum of food related writing. TT: Where do you source ingredients such as dry fruits and vegetables from? RMG: All over. Local markets, shops and via a network of foodies from all over the world. TT: What is your take on organic food? RMG: Well, I am not so much into organic, although I opt for it where possible, but I am into local and sustainable. TT: What has been the biggest joy that this profession has given you? RMG: Being able to do what I love and at the same time be with the people I love. Another great joy has been finally documenting the wealth of food knowledge that has been passed down by the women in my families (in-laws too). And as my career leads me to new cuisines, I cannot wait to pass on the knowledge I am amassing to my daughter. TT: Any plans on a cookbook? RMG: Yes! Several, actually! 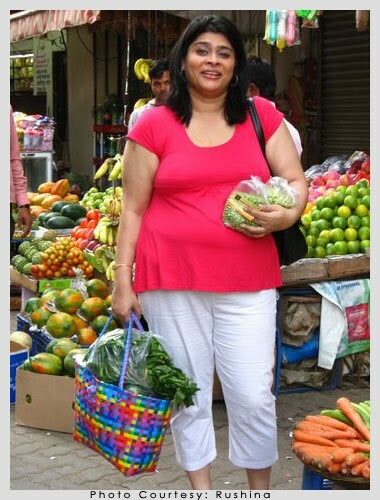 My first book, “My Mumbai Cookbook” is currently being edited. I also have another I am working on, on Uttarakhandi cuisine and now that I have been through the thrill of cooking, I have a third one simmering in my head! TT: What was your family’s reaction and support to such a career choice? RMG: Well, initially I do not think they had an opinion. They were happy as I was. And then they resigned themselves to my food obsession. Now they back me 100%, especially my husband, mom and mom-in-law, stepping in whenever I need to look after the kids. TT: Your inspirations for new recipes? RMG: Anything! New exotic ingredients, special diets and festivals. TT: Share with us that one secret ingredient that you love to use in most of your recipes. RMG: Stock. It can add a world of flavour where adding water can dilute it! TT: What is your favorite dish, favorite food program on Indian television and favourite restaurant? Favourite restaurant – depends on what I want to eat! Favourite Food program – Masterchef Australia, Jamie’s show, Kylie Kwong. TT: Top Chef, hosted by Padma Lakshmi and Chef Tom Colicchio is a reality program where chefs from different hotels and backgrounds in the US compete for title of the Top Chef. They have to go for various rounds of cooking from a basic pasta dish to using extraordinary ingredients to six course meals for celebrities and famous chefs in US who act as judges. What if such a program was hosted in India? Do you see yourself judging such a show in future in India? RMG: The show raises some interesting questions about food and expertise in food, whether tasting or cooking. Personally, I do not think that ‘food’ is the domain of chefs alone. I have deep respect for food that comes out of personal experience, born both from necessity and passion. And I know many women ‘untrained’ in formal culinary skills that could beat a ‘Top Chef’ any day. Given this opinion however, I do appreciate that Top Chef offers its competitors the challenge to cook for ordinary people in quite ordinary circumstance. Such a program in India would be a great success I think, IF WELL HANDLED, mainly because our Indian culture(s) is such that we have communicated with and through food since forever. It would be interesting to see what the competitors would come up with. As for judging such a show, I’ve always loved to learn about food and especially to hear the stories behind the dishes. If judging a show like this gets me a better portion and view, why not! TT: What is the average remuneration one can expect as a foodwriter? RMG: It is about how creative you can get. I made Rs.1000/- for my first assignment. When I took my sabbatical to have my second baby I was making 40 times that! Initially I accepted whatever food assignments came my way, regardless of remuneration. One year down the line however, I began to let go of low paying assignments because I found that these were the hardest ones to do. I also began to develop relationships with quality publications. You might need quantity in terms of bylines at the outset of your career but once you are established it is the publication you associate your name with that count and believe me, the good ones rarely have qualms about paying fairly! Most of us shy away from appearing avaricious. We are uncomfortable asking for more money. At times like this try to remind yourself that you are having that dialogue about money because the person at the other end feels you are worth pursuing. (let me share a secret here, I don’t stress about appearing greedy ever since I realized that it helps separate the wheat from the chaff!) Once you have work coming in, losing a quickie job that pays too little isn’t a bad thing, it just frees up time for you to write the kind of stuff you want to – paid or not! But at the end of the day it is about how you apply yourself! TT: What do you intend to do further? I came to know that you have launched ‘Masala Trails’. Could you tell us what it is all about? RMG: I continue to accept consultancy projects. I am also waiting for my book to be published. I have recently begun Masala Trails, my newest venture in partnership with my sister, Himanshi Munshaw – Luhar. Ever since I began foodwriting, I have used my profession shamelessly. (It offered the perfect cover to be greedy without appearing like a slob!) And as I travelled all over the world as part of many culinary tours, I would return with a dream of creating a food itinerary that would map India. India’s culinary scape is so vast that the cuisine changes every fifty kilometres and yet some of its most delicious culinary secrets are undiscovered. Almost as if the food gods were listening, my sister, Himanshi, set up a branch of my mother’s company ‘Beacon Holidays’, a company synonymous with niche travel, in Australia. I now had the strongest partner I could to make culinary tours of India happen. Called ‘Masala Trails’, these tours will wind through some of India’s most vibrant cities; Kolkata, Hyderabad, Cochin, Goa, Mumbai, Delhi, Agra and Rajasthan and aim to take the food traveller off the beaten track into lesser known regional cuisines of India. On the menu are dozens of carefully-selected experiences designed to bring out the full flavor of India that will span the spectrum from street food, home kitchens and fine dining experiences to market tours and demonstrations with expert cooks, chefs, local food artisans, and afford intimate contact with local regional cuisines, foodways and traditions. Hope you enjoyed getting to know about ‘food writing’ as a career as much as I did.If you would like to explore India by cuisine, please click through to www.beaconholidays.au. Also look for Masala Trails:Off the eaten path and A Culinary experience of India…. , an event in Facebook. In part-2, Rushina shares a favourite vegan recipe. Stay tuned. Hats off to u !!! Amazing work and great inspiration for all. I know some food writing courses that are conducted once in a while in Mumbai but none that are online. The best way would be to read as many writings as possible and start writing on your own. Compare, see where you stand and improve yourself. Thanks Jayasri for your words and wishes! Sassy Fork, welcome to TT:). Hope to bring you some really engaging posts in the future! what an interesting read!, loved every part of it, Lot of things to know about food writing, I love to write too ! !, Sometimes 24/7 is too short for me, I could really more hours in my day, so I can have my own time. It's wonderful to know that bit of food media in India. thanks TT, may be I will see you there one day.. Thanks everyone! I wanted this space to show the Indian scenario as it is regarding the food industry. Rushina did a wonderful job answering the questions and I am glad some of you have found answers to your questions too! Gratitudes from the deepest of my heart for this brilliant post. I have been wanting to know details about food writing and the answers just pop up right here! And yes, such an enjoyable reading.. I wish you planned to cover the south in your masala Trails..it sure is an exciting one..
excellent interview… really enjoyed it. for me it was additionally perfectly timed because i am looking at continuing my food writing and taking it to the next possible level. fantastic… to know more about rushina. Great post. Love the interview and your take on food media in India.